Char-Broil has been making the CB940X for a very long time, and it’s been such as good seller over the years, that the chances are you’ve probably tasted its food before, and haven’t even realized it. But, manufacturing standards change over time, as do Char-Broil staff, and new technology is invented, so it’s not the same grill as it was all those years ago. Various models are been sent to stores, all with their slightly different individual features, so each one is worthy of a review to let buyers know what they’re purchasing right here, right now. I’m going to be traveling beyond the description on the box; deep into the grill itself, highlighting all of Char-Broils successes, and revealing the hidden flaws they’d rather you didn’t know. When you’ve finished reading this you’ll be armed to the teeth, with CB940X knowledge, but more importantly, you’ll be in the best possible position to decide if you want to make a purchase. Theoretically, you could take the CB940X camping or tailgating, but you’d need to have a truck, or de-construct the whole thing for re-assembly in the other location. Many people will do that, and if you’re one of those people, then your commitment to top quality grilling whatever the location, is admirable. Most people, however, buy large grills like this because they entertain lots of friends at home, and they want enough space to be able to feed them all. Which is not to say portability is disregarded; buyers don’t want to have to pick the whole unit up, so good wheels are must, and the CB940X is a huge success in this area, with big, thick wheels, so you can roll it out to the cooking position, then roll it back. The whole thing is 189 pounds, and measures 22.5 inches in length, by 59.5 inches of width, with a height of 42 inches, hence the importance of the wheels. These grills still are and have always been built to last, made of quality cast-Iron, which will not rust, so buying one means, you’ll be cooking on it 20 years from now. Being a large grill the assembly is quite complex, so we’re not talking about a 15-minute job, you might find with a smaller grill, but a smaller grill won’t give you the kind of cooking volume you get here either. The assembly can be done in 30-45 minutes following the instructions in the manual, but be sure to follow them carefully, and resist the tendency to skip through parts. Post-assembly, take a step back, and you’ll see that you have a giant grill, with a very large 435 square inch central cooking area, and 180 square inches of space for warming. The warming room is a real plus point because you don’t have to rush out food to guests; instead, you can leave it there, and people can pick it up when they’re ready, and come back for more. You can also do sauces here as well, and everybody loves sauce, right? There’s also a good amount of storage space underneath, and a front access door for putting more coals on the fire. I want to talk more about the trap door because it has its good and bad points. It’s good because you don’t have to walk around to the back of the grill, just to put more charcoal in, but it also lets a lot of air out, which becomes a problem if you’re smoking meats. In practice, it means smoking meats might take a little longer, but personally, I’d rather have this inclusion than not have it, because, on some grills, it’s a real problem to put coal on the fire, and this makes that much easier. The grates are cast-Iron, and they’re very good, with a nice thickness, for excellent heat retention and even cooking. Food tastes moist and succulent, almost like you just ordered it at a restaurant, It really is that good, and for many people, this will be the deal clincher, because after all, taste is what counts. There’s some excellent heat dispersal here, and although the outer-edges can be considerably cooler than the rest of the grill, there’s a lot of space in-between for some terrific evenly cooked food. Full marks for taste and grates. The vents are also pretty good too, although I’d have hoped for more individual adjustments because this is a superb grill. 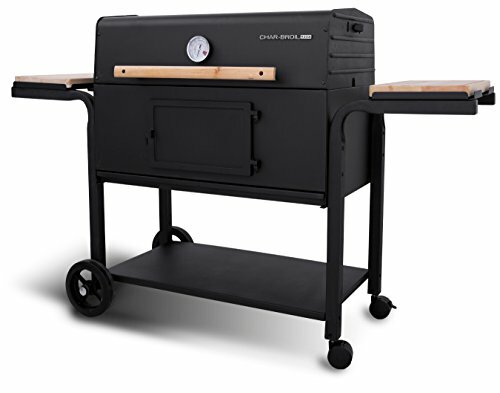 The Char-Broil CB940X 08301390-26 Charcoal Grill, also allows you to cook directly or indirectly. Direct grilling means you’re placing meat on the lovely cast-iron grates directly above the flames for cooking, while Indirect Grilling means the flames have a slight angle to the side. We’ve all bought products before, so we all know company descriptions can be misleading sometimes, and this is one of those things. It is correct that you can build the fire underneath, or to the side of the meat, and grill indirectly using the CB940X, but it’s not true that this is a major selling point because you can do this on most grills to some extent. Although with the large surface and great lid you have here, you do get a different taste here grilling indirectly, and it certainly makes smoking meat a more authentic experience. So, it’s an excellent inclusion, but no great breakthrough that would make indirect cooking any different than on other large grills. Couple of extra things you should know are that you should buy gloves, because the surface here, gets extraordinarily hot, and that the CB940X is not seasoned, so give the cast-iron a quick wash before use. The CB940X looks good and cooks great, it is one of the best charcoals currently available. After you get past the assembly, it’s a truly wonderful experience owning a grill like this. The taste of meats cooked on these cast-iron grates is something special, and the space for cooking is immense. You can grill or smoke, and there’s a nice little trap door in the front for shoving more charcoal into the fire, which adds ease of operation to the deal as a sweetener. The Verdict: Heavy, but quality results are guaranteed.